Market Street for Taj Mahal, a good trade? I still haven't unloaded the Market Street I purchased last month in a moment of weakness. I now have the opportunity for a trade. Do you think a complete Market Street with Instructions is a good trade for a complete Taj Mahal with Instructions? Neither set has a box. Whichever set I end up with, I am planning to sit on it for 12 months and ebay it. If you don't want A and want B, then yes it is a good trade. I assume you are going to meet and exchange rather than post it? Yes, it'll be done in person. I don't really want either one. My intention has been to sell all along. I am just trying to look into a crystal ball and figure out which one will be the better payout in 12 months. If you know yours is complete, then stick with it. Otherwise, you will have to check that the other one is also complete before you can sell it. I would stick with the Market Street set. I think it has a wider appeal and its value seems to be climbing steadily. I agree with Renny. I think Taj Mahal is a better set, but if you're not wanting it for yourself, I feel like Market Street has greater potential in terms of resale value. Now that the ball's rolling, I'll drop the other shoe. I need to make back $750 after fees, etc. to cover the original Market Street purchase and an additional purchase for my kiddos that I am keeping. Still think Market Street can do that for me in 12 months? Except for a couple of squirrely auctions, it looks like Taj Mahal is steadily pulling more than Market Street right now, even without a box. so this is the MS that had the horribly taped up box? BTW, sent off pics to UPS. No news yet. ha ha ehhhh. The Taj Mahal will do better in the long haul I think. 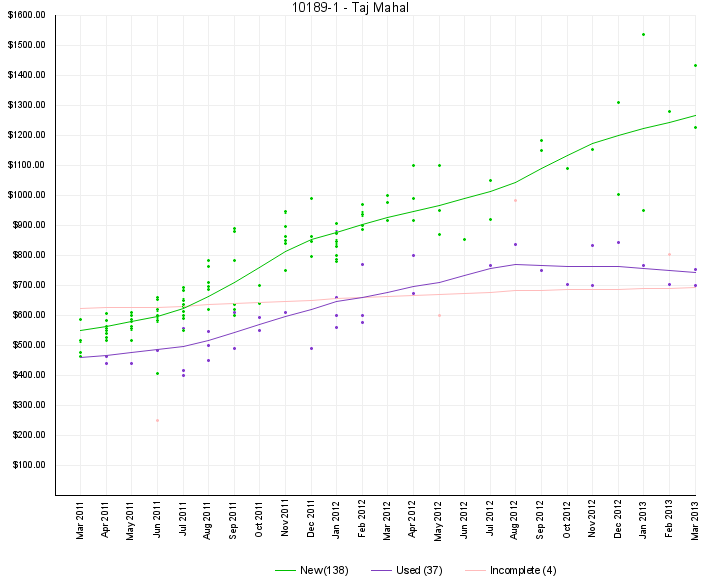 So, basically, over the past 2 years, Taj Mahal has done better overall, but appears to have leveled out recently. 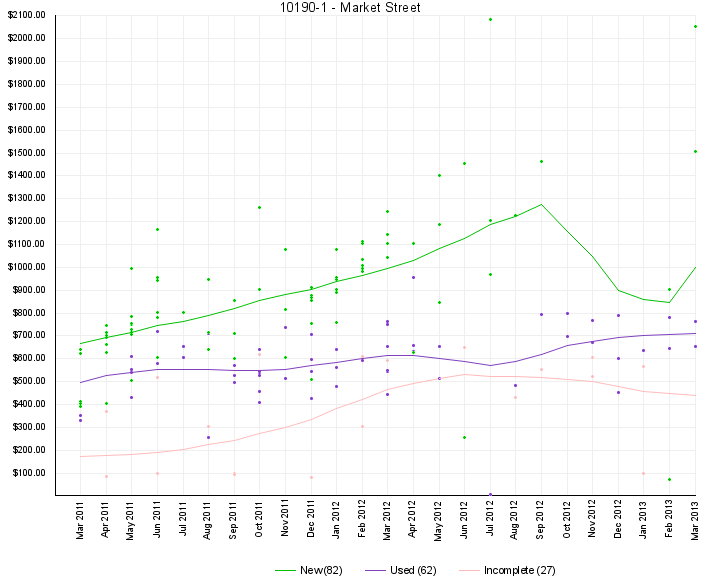 Market Street didn't make the same overall gains, but has had more reliable growth.